As I take my first steps into trying to understand the place of place writing in Australia I find there is a lot of discussion out there about what constitutes this relatively new genre in Australian literature. Although the tradition of ‘nature writing’ is strong in North America, it is far less defined here. I want to bring together as much of the conversation on this topic as I can gather from various sources in an attempt to get a more complete and broader view. 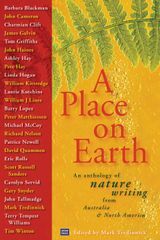 This review by Charlotte Wood of A Place on Earth: Nature Writing in Australia, an anthology edited by Mark Tredinnick, not only talks about the essays included but also cites leading writers, Pete Hay, Eric Rolls, Patrice Newell and Mark Tredinnick, speaking about their take on the literature of place. This entry was posted in All posts, Books, Uncategorized and tagged Charlotte Wood, Eric Rolls, Mark Tredinnick, Patrice Newell, Pete Hay. Bookmark the permalink. I’m quite surprised that there is not much literature on a topic I thought would be covered quite well in Australia. It is strange, considering the diversity of our landscape and the depth of our talent.